class="page-template page-template-page-sections page-template-page-sections-php page page-id-201 samba_theme wpb-js-composer js-comp-ver-4.1 vc_responsive"
Hard-wearing, but easy on the eye! Hard-wearing carpets can still look great! Carpets that look great but are made to withstand the daily office environment. Striking luxury carpets for hotels that are both contemporary yet durable. Impervious backed contract carpet which is hard-wearing and highly resistant to permanent staining. Existing flooring uplifted, in readiness for sub-floor preparation and new flooring installation with superior workmanship and attention to detail. 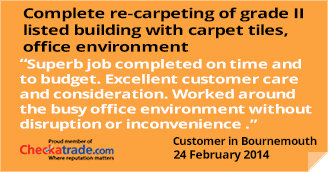 Installation of new commercial carpet that is ready for its new occupants. Perfect for offices, shops, schools and any high-traffic areas. We have a vast range of commercial carpets, contract vinyl, luxury vinyl tiles and safety flooring to suit premises such as: offices, hotels, retail shops, restaurants, care homes, nursing homes, bars and schools, to name just a few. We are used to working to tight schedules and will do everything we can to work around your business’s operational needs. Our competitively priced supply and installation service includes re-surfacing of sub-floors (with levelling and smoothing compounds or plywood sheeting) and a full uplift and disposal of existing floor coverings. Our fitters can do as much or as little as required, whether you need furniture removed from rooms and reinstalled, we can complete this stress free project for you. If you’d like help and advice in selecting flooring or require any samples please contact us.